Back from nearly a week in New York City, in sweltering heat with high humidity. I had hoped to take photos of women there, but left my iPad in the plane. I got it back, but too late to take photos. During the week of 32C/90F temperatures, women wore black that hung away from the body: floaty a-line sleeveless dresses, loose-cut pants like Eileen Fisher's, loose linen tees or light white blouses. That's what I took too, and several scarves that were too hot to wear. But window shopping told another story: colour in the most ardent forms, prices climbing like the thermometer at the exemplary designers'. I was colour-drunk in Saks' Etro boutique. 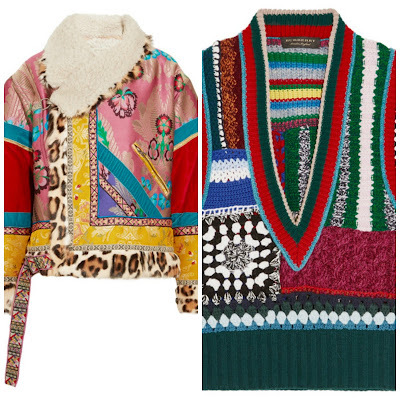 Fortunately, if you have over $8,000, you can get the same piece (shown below left ) at net-a-porter. Burberry's crazy-quilt vest has already sold out there, but Saks had it, too, and I thought of knitters like materfamilias, who could take that on. 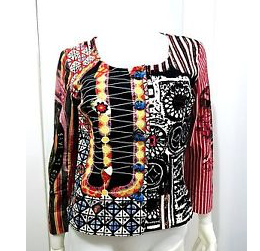 When your eye is enchanted via these houses, you see that these clothes cannot be copied successfully. Mid-range department stores were a downer after such outré opulence: sedate burgundy, endless shift dresses and the basic trousers you wore for your first job. Poly, even when vividly printed, cannot even hope to match the world's best dyes on plush wools or velvet. I about wept. If you sew, you might hunt these magnificent fabrics and trims, then compose and tailor you little heart out. For those of us whose last seat at a Singer was in high school home ec class, a good-sized scarf is a decent cheat. 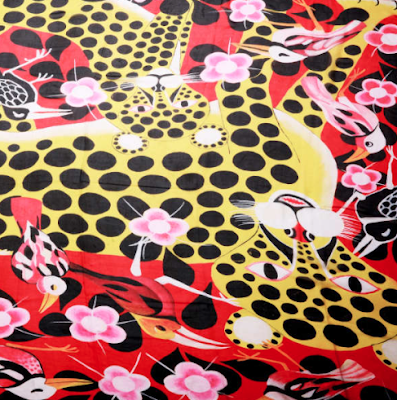 Lisu Moshi's "Chui Red" chiffon rectangle delivers those exotic colourways, and is light enough to wear indoors. Price, £120 at Wolf and Badger. 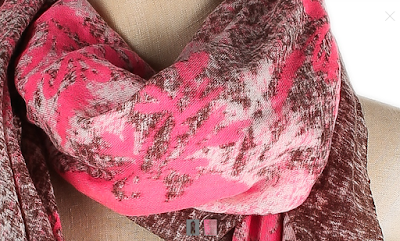 The Danish brand Epice make terrific scarves, always with a colour suprise; I love pink with cocoa brown. This detail below is from a wool/silk/cashmere blend shawl that is $330 at Bliss. Or you might have a lucky strike like one of my Susanfriends, who found a Save the Queen knit jacket at a Sutton, Quebec flea market for $2! 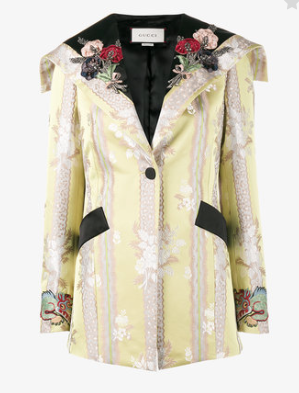 At Etro, I thought, Spectacular, but how do you wear this? Then I remembered a stylist's axiom: " 'Matches nothing' goes with everything". Such riotous colour is actually more versatile than a bright solid, which can cut all but the longest-bodied woman in half. Artful colour play is magic, moving the eye about and pulling everything together. Speaking of magic, if you're in New York this fall, I suggest you see Derek Del Gaudio's, "In and Of Itself" which is to the classic magic show what Etro is to fabric: another conceptual level. DelGaudio's theme is identity, and his performance, which includes magic, monologue and memoir, is an entrancing evening. It will be interesting to see if colour takes off. It would be a pleasant change from the omnipresent black and dark grey that I see everywhere. I feel lucky to have grown up in the 60s when colour was celebrated. It's one of the joys of life and I feel sad for those who miss out, especially the young. I also feel lucky that I have a pile of Jan Becker scarves to call on...thanks to your post a number of years go about her sales. Thank you for the compliment on my putative knitting skills (and I see that sweater has some crocheting thrown in as well! ), but wow! not so much the patchwork but the math skills to make those different gauges all come together in a garment that actually fits and flatters. . . beyond me, and that will be a contributing factor to what one (never me!) would be paying for. . . . And, tbh, one would pay a pretty penny already to have the stash of different yarns represented here -- I would imagine this comes with a Dry Clean Only label -- I can only imagine the different ways this mix of wool, silk, whatever, would perform when in the proximity of water and heat. I like your approach best -- admire as a museum piece, draw on as inspiration for colourwork, texture-mixing, etc., and then walk away. . . Sounds as if you had a great time in NYC. I'm so glad that you had a wonderful trip - there's no place in the world quite as thrilling as New York. Thanks for sharing your observations and insights. Burgundy can be a wonderfully rich colour or terribly drab; once again it depends on fabric and dyes. I've been seeing some forest green clothing, which is heartening. Lime green makes me look sick, and I love green. I love colour, but I also love "uniform", which would tend to rule out very bright colours except as accessories, or in the summer heat. Livia is solid black, but those electric green eyes!